Unfortunately the EVJ and GA5 Combos are No Longer in Production. This Amp is now an Icon - It has to be one of the most Modified Valve Amps of all time. The Amp is a Great ‘Base’ to work from, it’s Simple design leaves it wide open to just about any Modification. With just a Few component changes, the Standard 'DULL' Amp can be Transformed into a real Performer. The Internet is Cluttered with sites devoted to Modding the VJ, some offering good information and others not worth looking at. Contrary to Popular Belief, these Amps are NOT 5 Watts. The True RMS Output is no more than 3.6 Watts with the PEAK Power Output being about 6 Watts. This is Mainly due to the Small Output Transformer. 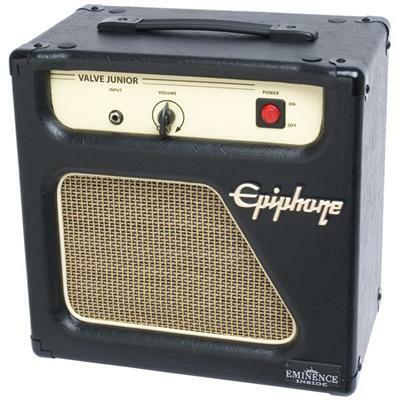 Epiphone Valve Junior V1 - The First of the Breed. Excessive Heater BUZZ due to Very Poor PCB Design. Not a Nice Amp and Rapidly Replaced with the V2. 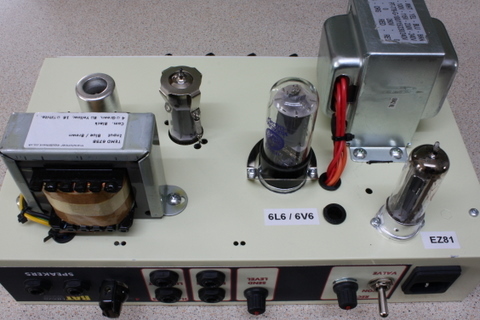 Epiphone Valve Junior V2 - Second Issue with a redesigned PCB, DC Valve Heaters and Additional Power Supply Smoothing. A LOT Better than the V1 but still with some ‘Noise’ Issues and other Serious Faults present from the V1 design. No Longer Made. Grainger Valve Edition 5 - Exact same Amp as the Epiphone VJ V2. Made in the Same Factory, just a Different Name Badge on the Front of the Amp. No longer Made. 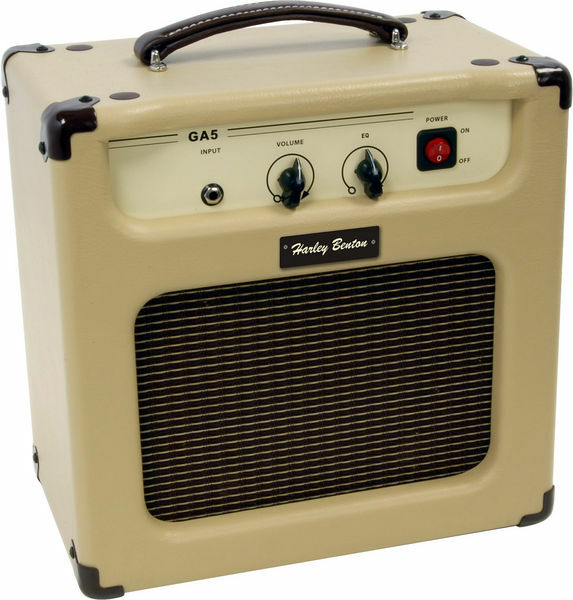 Harley Benton GA5 - The Same Amp as the Epiphone VJ V2 with the addition of an ‘EQ’ Control and Re-designed ‘Cream’ Colour Cabinet - Made in the Same Factory, just a Different Name Badge on the Front of the Amp. No Longer Made. Epiphone Valve Junior V3 - Third Issue with Up-graded Output Transformer, Several Component Changes on the ‘Black’ PCB and a Nice ‘Eminence’ 8 inch Speaker. A HUGE improvement over the V2 Design but it Still has some ‘Issues’. No longer Made. Epiphone Valve Junior V3 Head - No Longer Made. 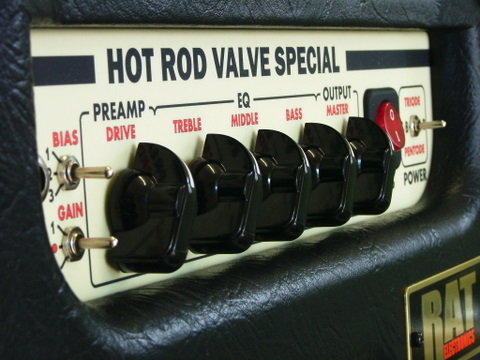 Epiphone 'Hot-Rod' Valve Junior V4 Head with Reverb - No Longer Made. 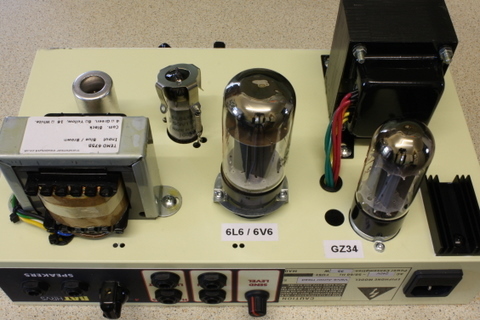 The Valve Bias and HT Voltage is set on each Individual Amp to match the Modifications that have been done. 1. 'OPR' - Output Power Reduction - This is the Business and essential for an Amplifier used in the Home. I Have tried ALL of the other systems that claim to Reduce the Volume without changing the Tone - 'OPR' really works. 2. 'OPR-1+2' - - - This Dual Function Switch allows two Distinctly Different Sounds when the Main 'OPR' Control is in Use - 'OPR-1'....Maintains the High Harmonic Content in the Final Sound - 'OPR-2'....Is Much Softer and Cleaner Sounding. 3. 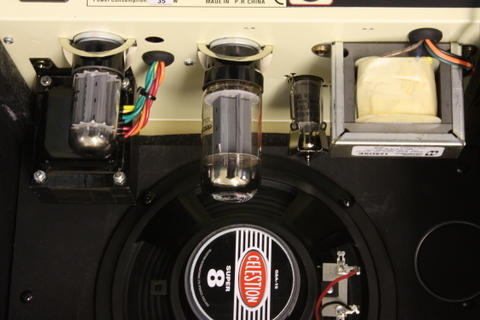 Dual Output Valves Switched - The Amplifier is Fitted with 2x Different Output Valves, usually an ‘EL84’ and ‘6L6GC’. You can Switch between the Valves for a Totally different Amp Sound. Works OK with the Standard Output Transformer but is a LOT Better with an OPT Upgrade. 3a. Dual Output Valve 'MIX' Function - This System is based around one Rotary Control. The Amplifier is Fitted with 2x Different Output Valves. The Rotary Control Allows Selection of Just One Valve or the Other (EL84 -or- 6L6GC) -or- Any 'MIX' Between the Two Valves. Using the 'MIX' Control you can get a Great Bit of 'Brit Crunch' (From the EL84) Mixed in with the 'American Clean' (From the 6L6). The Output of the Amp will be a Full 12 Watts RMS (About 20 Watts Peak Power). This Modification Requires the Output Transformer to be Upgraded. A Hammond 125DSE is the Best. 3b. Dual Parallel Output Valves - This System uses 2x Output Valves (2x EL84) Running Side-by-Side in Dual Parallel Mode but Retaining the 'Single Ended' - 'Cathode Bias' Configuration. It Gives a Great Power Boost, up to 12 Watts RMS and really Gives the Amp some 'BITE'. The Modification Requires the Output Transformer to be Upgraded to a Hammond 125DSE -or- ESE. 4. 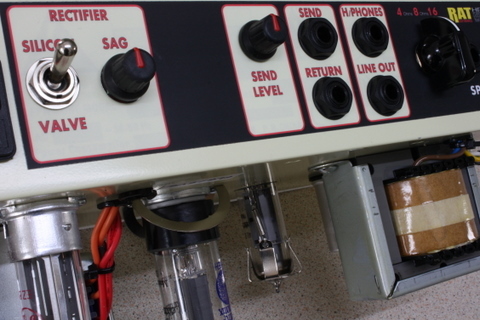 RAT 'TriRec'- This Option uses a Three Position Switch and an 'EZ80' Valve Rectifier, It Integrates Seamlessly into the VJ Circuit and offers 3 different types of Rectification. Position 1= Standard Silicon Diodes - Position 2= V1, 'EZ80' Valve Running at Half Power, This gives Maximum 'SAG' - Position 3= V2, 'EZ80' Valve running at Full Power, Offers Reduced 'SAG' but maintains the Classic Vintage Valve Rectifier 'Feel'. 5. New Output Transformer (OPT) - This is Perhaps 'THE' most Important Component in any Valve Amp. Changing the OPT to a Decent Quality Unit will increase the Output of the VJ Amplifier from around 3.6 Watts to 5 Watts RMS (10 Watts Peak Power). That is not the Only Benefit, it will offer Better and Tighter ‘Bass’ Response along with Cleaner and Clearer ‘Mids’ and a Much better Defined ‘Top’ end. These Transformers are Expensive but well worth it. The Best is a Hammond 125DSE -or- 125ESE for Superior Headroom. 6. REVERB - All Valve Driven using a '12AT7' (ECC81) Valve for Drive/Recovery, Hammond/MoJo/Epiphone Driver Transformer and NOS (Made in the USA) 'Accutronics' 3 Spring (Short) Reverb Tank. This is a Superb Modification and works Great with the 'HRVS' Amp. Requires a Hammond 125DSE Output Transformer and 'Dual Parallel' Upgrade. You can Also have a Reverb On/Off Footswitch If Required. This is the single most expensive Modification to the VJ Amp as I only use the Best Parts Available. 7. Master Volume Control - If the Preamp Valve 'Bias' is set Correctly, a Master Volume Control will allow - Preamp Overdrive Only -or- Power Amp Overdrive Only -or- Both. All RAT Amps have a Master Volume Control. 8. 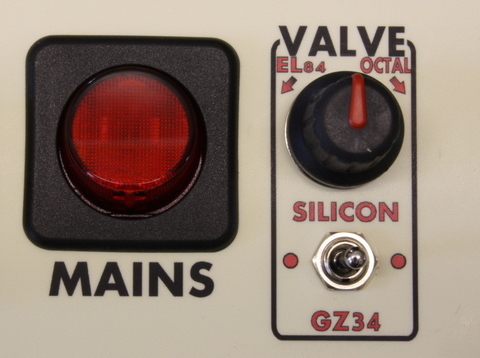 Three Position Preamp Valve ‘Bias’ Switch - Switches the Preamp ‘Bias’ between - ‘Negative Feedback’ -or- ‘Sharp+Clean’ -or- ‘Medium/High Gain’. Exclusive to RAT and fitted on All Amps. 9. Three Position Preamp Valve ‘Gain’ Switch- 'Center’ Position is VJ Factory Standard - ‘UP’ is Medium 50% Gain - ‘Down’ is High 100% Gain. This Switch works well in conjunction with the ‘Bias’ Switch and gives the Amp some real BITE. Fitted on all RAT Amps. 10. Tone Control - Allows Selective Boost or Cut of the Upper or Lower Frequencies of the Input Signal. The 'Mid' Frequencies are Maintained. This 'Tone' Control does NOT Obstruct the Signal Path, Preserving the Amps Detail, Clarity and Volume. Fitted on all RAT Amps. 11. 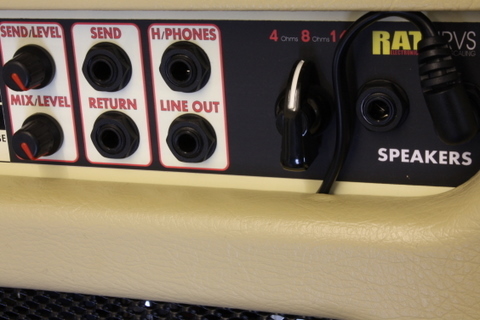 Line Out and Headphone Sockets - Nothing Special here but these Sockets are Fitted on almost all RAT Amps and Include a Speaker Output 'Dummy Load' - So you can use the 'Headphone Socket' -or- 'Line Out' With or Without a Main Speaker Connected to the Amp. 12. 2x Speaker Outputs and Impedance Select - The Output Transformer usually offers individual Speaker Outputs of 4, 8 and 16 Ohms. The RAT Setup is Simple and Straightforward to use - Connect a Speaker or Speakers and select the Correct Impedance - Done. Fitted to all RAT Amps. Includes an Auto-Switching 'Dummy Load' on the Outputs. 13. I usually Fit a Celestion 'Super 8' Speaker (Recently Replaced by the 'Eight-15') to the V1 and V2 Amps. It is the Best Speaker for the Job and has a Great 'Rock' sound when Pushed. It is an 8" Speaker Rated at 15 Watts, 8 Ohms. The V3 Amps are Fitted with a Very Nice Sounding 8" 'Eminence' Speaker. I leave that Speaker in Place. 14. There are Several 'Other' Modifications I do that Enhance both Performance and Reliability. 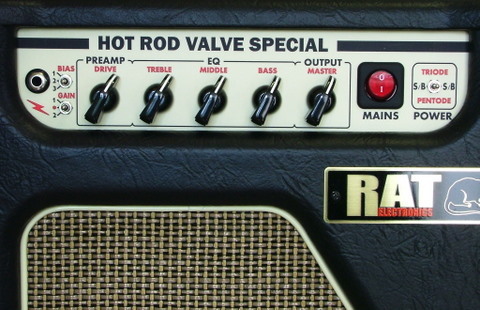 The Background 'Hiss' from the ‘HRVS’ Amp is so Low, you may not notice it is Switched on.